As the days grow short and winter looms, the lengthening evenings offer ample time and reason to brood over the nature of darkness. As the stories in this issue attest, a landscape of shadows offers far too many opportunities for both deception and misperception. To mitigate the darkness a bit, mid-level coworkers wreak their own special brand of havoc in plain sight in Robert Lopresti’s “The Chair Thief,” while R. T. Lawton’s Holiday Burglars return in “Black Friday,” where they must face up to their competition. Each of B. K. Stevens’s Leah Abrams mysteries take place around a different Jewish holiday, and “Death Under Construction” is set during the fall harvest festival of Sukkot. Leah takes a temp job at a firm that makes luxury doghouses while she works on her academic tome on workplace communications, so she is receptive to the subtle clues when the firm’s manger is killed in the storeroom. We welcome back to these pages Carol Cail, with her tale of mysterious goings-on and hidden rooms at a seniors’ community in “Ghost Busters.” And we welcome Anna Castle, whose first story for us is “For Want of a Book,” featuring a young Francis Bacon. 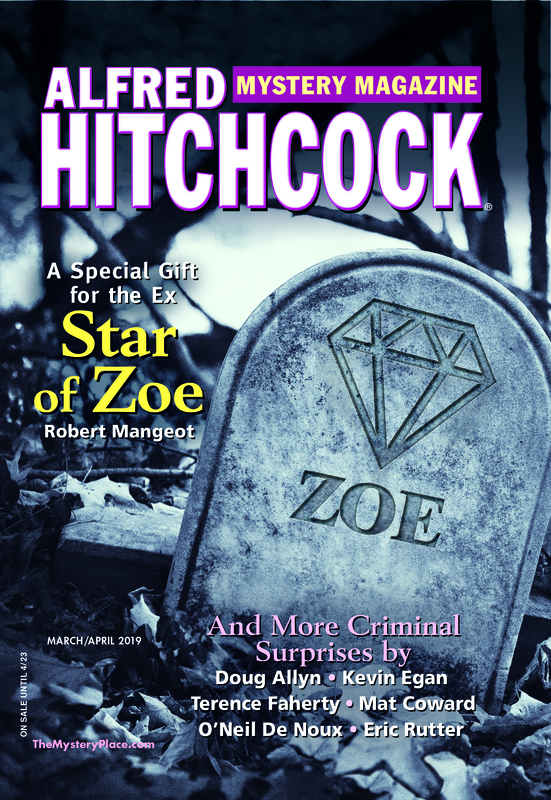 This issue also features the second installment of our new feature The Case Files: this time, Steve Hockensmith brings to light some cutting-edge mystery-related podcasts. We’re sure you’ll want to check them out. So there’s no need to be afraid of the dark when you have such a substantial issue of great stories with which to while away the evenings.